We are a Malaysia professional food machinery manufacturer specializes in development, production and sales of snack food machinery and kitchen equipment. Our main products consists of a wide range of food machinery including ice cream machine, waffle machine, kayaball machine, takoyaki machine, popcorn machine, deep fryer, warming showcase and snack food equipment, etc. All our snack food machinery are newly design, energy saving, environmental friendly and equipped with advanced technology. 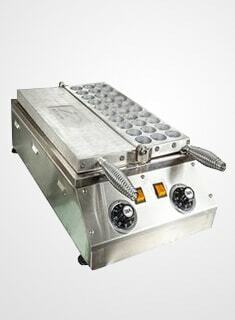 Our snack food machinery can be used in hotels, supermarkets, restaurants, bars, and kiosk counter. We import foreign technology and introduce advanced production equipment and quality test equipment in our manufacturing process. We have a team of experienced mechanical, electrical and gas engineers, professional production team and after-sales service team with more than 20 years of experiences. We devote our energy to developing, producing, processing new food machinery and non-standard customized food machinery in order to adapt to the fast changing consumer market to meet customers' requirements. We consistently stick to our objectives of high quality, lower prices and to serve old and new customers with heart and soul.